Located on the shores of the Red Sea on a lovely 1km long golden sandy beach in Hurghada, the Hilton Hurghada Long Beach Resort is a family-friendly luxury resort offering six swimming pools, a fitness centre, 12 bars and four lovely restaurants for guests to enjoy. Featuring comfortable, well-appointed guestrooms that offer excellent views from their balconies, the hotel invites guests to relax in the lap of luxury with sitting area and sofa, 25-inch satellite TV, en-suite bathroom and a minibar. For the tiny tots, there is a kids’ club, an entertainment centre and a playground. For guests’ recreation, the hotel can help arrange a jeep safari or thrilling water-sports. 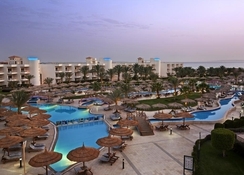 Located on the shores of Red Sea, Hilton Hurghada Long Beach Resort is located on a 1.1km stretch of sandy beach. There are good shops, cafes and restaurants nearby. 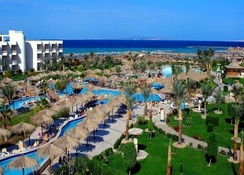 The Hurghada International Airport is 17.7km from the property. 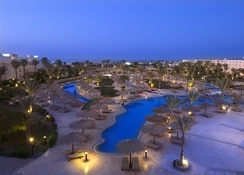 Hilton Hurghada Long Beach Resort offers three categories of rooms to cater to all kinds of requirements of the guests. The spacious rooms come with lovely garden or sea views from a private balcony. These are equipped with sitting area and sofa, 25-inch satellite TV, en-suite marble bathroom and a minibar. Wi-Fi access and bottle of mineral water is available. Suites come with an additional lounge area and the Family Suite is the ultimate for large families or groups with a second bedroom and bathroom. Hilton Hurghada Long Beach Resort two main restaurants, Lotus and Al Dente serve an array of local and international cuisine and feature a kids’ corner. Egyptian a La Carte dinner is served at Marhaba Restaurant and is accompanied by an exciting oriental show. The Podium restaurant is the place for fine dining with show cooking. Watch expert chefs dish out delicious fare prepared by expert chefs from the freshest of ingredients. The hotel has 12 lovely bars, from elegant bars by the poolside and by the beach where guests can relax with cocktails. 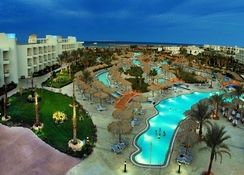 As many as five swimming pools invite guests at the Hilton Hurghada Long Beach Resort. They can soak in the sun at the private beach equipped with sun loungers. The hotel has a terrace with outdoor fireplace and can organise BBQs. The hotel has facilities for sports such as diving, mini golf, ping pong, racquetball, snorkelling, tennis and windsurfing. There is a library from where readers can borrow books from, while the tiny tots are engaged at the kids’ club and playground. Towel cards regulations, to be received from front office upon check in without any deposit . -On the other hand be informed that regarding to Late dinner will be as a Cold cuts and to be served from 22:30 till 00:00 in the Main Restaurant ( reservation required in advance ). Served from 06:30am till 10:00 am in “Al dente” restaurant. Served from 10:30 am until 12:00 pm at the Pool and Beach Bars. Buffet served from 12:30 pm till 3:00 pm in “Al dente” Restaurant. Served from 12:00 pm until 4:00 pm at the Pool bar and beach bars. Served from 12:00 pm until 1:30 pm and from 3:00 pmtill 4:30 pm at the Pool and Beach Bars. Tea and Coffee served with assorted pastries from 4:00 pmtill 5:00 pm at the Pool and Beach Bars. Oriental buffetin “Al dente” restaurantfrom 18:30 till 22:00.Late dinner cold cutsserved from 22:30 till 00:00 in the Main Restaurant;Must be reservedin advance. ❖Show cooking set menu served from 6:30 pmtill 10:30 pm at Marhaba Restaurant. ❖Guests staying 5+ nights are entitled to a dinner once per stay. ❖Priorreservation is required; reservation desk is inthe lobbyfrom 11:00 till 13:00 and from 15:00 till 17:00). ❖All-inclusive activities: tennis, squash, table tennis, mini golf, billiard and gym. ✓Mini golf and table tennis are in family building area. ✓Squash is located in Hilton Fitness. ✓Tennis is in upper villa level. ✓Billiards are in Aqua Lounge. ❖Billiard table are available at the Aqua Lounge. From 10am till 6pm is free, after that till midnight costs 50 LE. ❖Tennis & Squash racquets are available at extra charge. 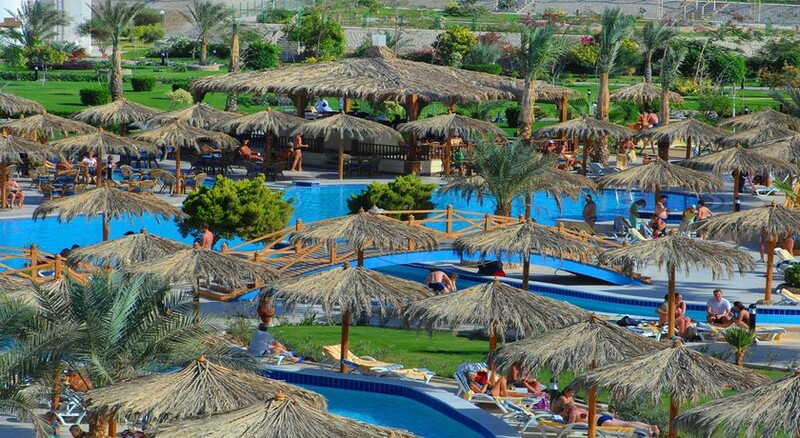 ❖Swimming pools are open from 8:00 am until sunset. For health and safety reasons, a proper swimming suit must be worn in the swimming pool. Loose or cotton clothingis not allowed, cut of jeans, pants, long customs, dresses are not allowed in the pool. ❖Gym opens 24hours, 7 days a week.You can easily get in with your room card. ❖Sauna, Steam room, Turkish bath, Jacuzzi and massage facilities are available in the Spa with extra charge from 9:00 am till 7:30 pm. For more information please dial 4096. For more information about daily animation programs please check the animation boards beside Lotus restaurant. Restaurant entrance & Family pool and Beach entrance. 24 hours /7 days with extra charge. Dial 0. Free only in the Aqua Lounge. For help please contact the reception. Available in the lobby with extra charge. Draught soft drinks, packed juices and mineral water. Local draught beer, Local red, rose and white wine (indoor only). Local vodka, gin, rum, whisky, brandy and ouzo. ❖From 10:30 am till sunset at the Pools & Beach Bars. ❖From 10:30 am till 7:00 pm at Vienna Bar. ❖From 10:30 am till midnight in the Aqua Lounge. One bottle of mineral water will be supplied free of charge per room per day. NB: Times and locations are subject to change without prior notice (Seasonality and Weather permitting. ❖Check-out time is 12:00, checking-out after 12:00 will be against charge. ❖Food, beverages, plates and glasses are not allowed outside restaurants and bars. ❖Please note that “All-inclusive” bracelet must be worn at all times. ❖All the beverages are ordered and served by glass, one drink at a time. ❖To stock your mini bar with alcohol or soft drinks, please dial 4239. An extra charge will be applied for this service. ❖Towel card must be presented tothe reception upon check-out to avoid extra charge of 200 LE..
❖Children must always be supervised by an adult. ❖The management takes no responsibility for valuables left in guest room, safety deposit boxes are available free of charge in all guest rooms. ❖For your comfort & tranquility please approach our recreation team to ask for red flag (Don’t Disturb) and for more information about quite areas designated to our valuable guests on the beach and pools facilities. ❖Children under 18 are not allowed to enter the disco. ❖Visits are not allowed inside the rooms for your safety and security. ❖Fishing is not allowed at all as per the Egyptian law. Was an awesome k hotel but no longer owned by Hilton Honours. Great hotel. Immaculately clean. Excellent customer relations. Good Food. Fantstic weather and a sea breeze to die for. Blew away alot of my stress. Exactly what the doctor ordered.